Aura transforms the image of the human body into a luminous anthropomorphic form. 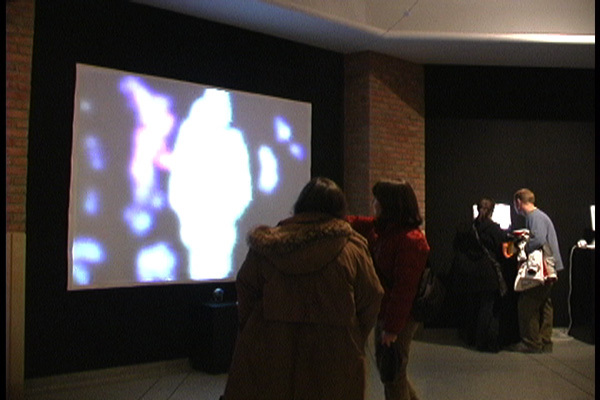 When participants move, they see their luminous image responding in real-time. Participants are taken on a journey through different celestial and cellular representations of themselves, and permitted to move about freely within the space to explore their own illuminated form. If participants stay for a while, their glowing form will be recorded into the projection for the next cycle. Then the participant can use their current aura to interact with past auras, their own or that of others. A camera under the projection feeds video into a comparison algorithm that looks at changes in video to a reference frame. The subset of different pixels is used by the drawing function. 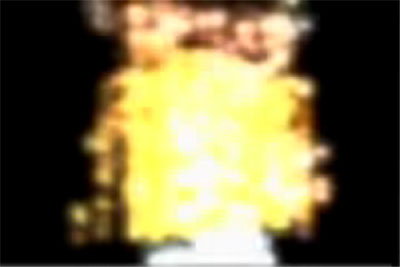 OpenGL handles the blending of sprites that accumulate to generate form.